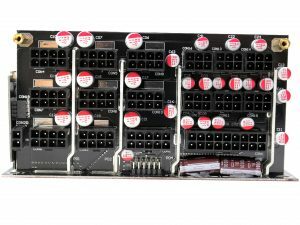 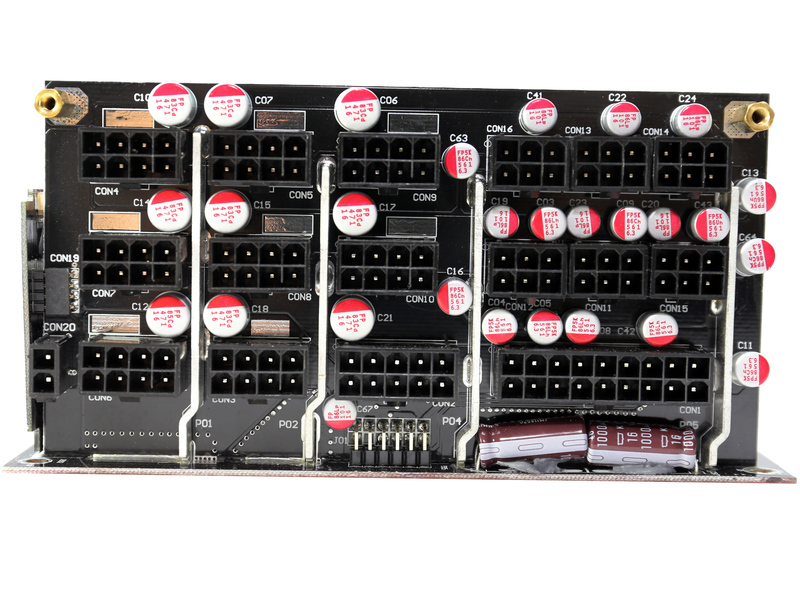 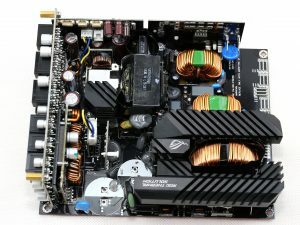 Asus took Seasonic’s Prime Platinum platform and made lots of changes to make it compatible with its needs. 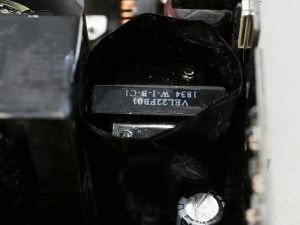 For starters an OLED screen was installed to depict the unit’s power draw. 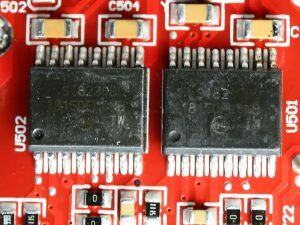 The information provided to this screen is processed by a micro-controller. 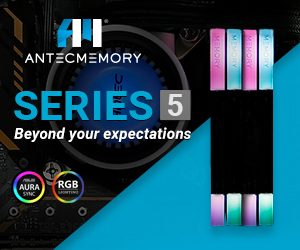 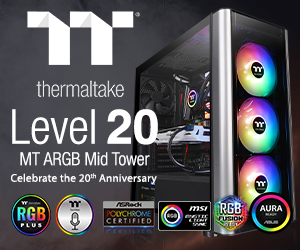 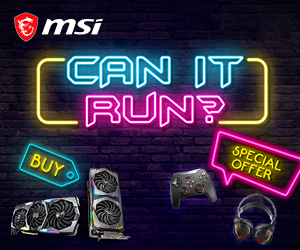 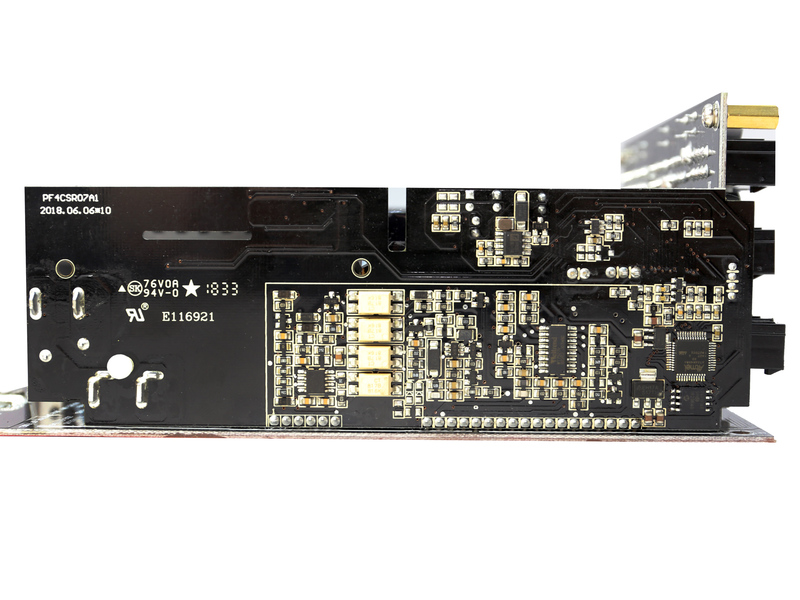 Moreover, the platform features addressable RGB lighting which can be controlled by a compatible mainboard. 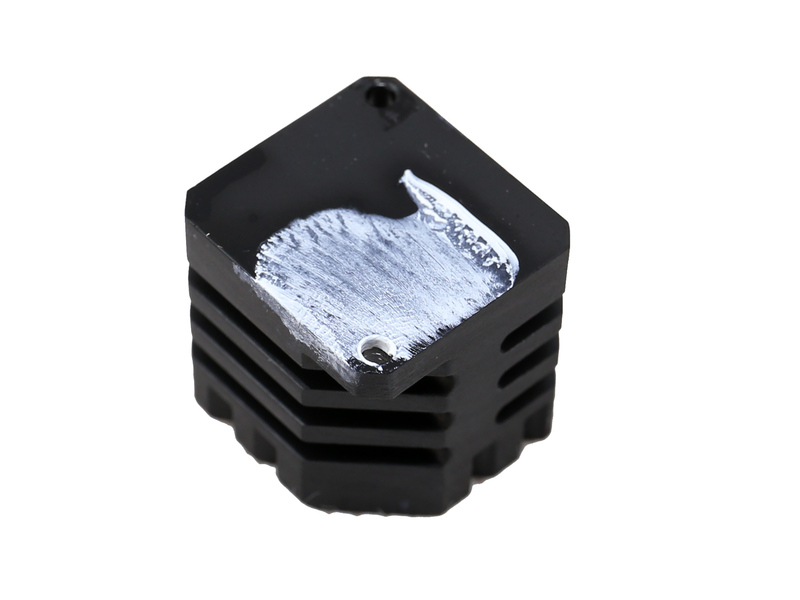 The most significant changes are though the much larger heatsinks and the double ball-bearing fan. 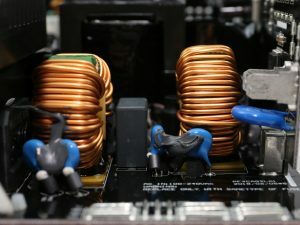 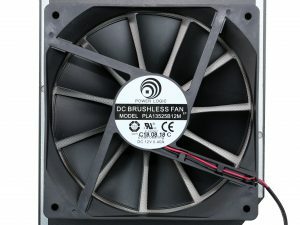 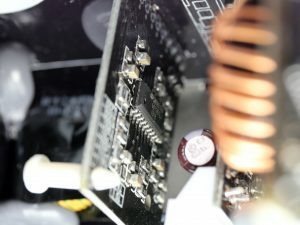 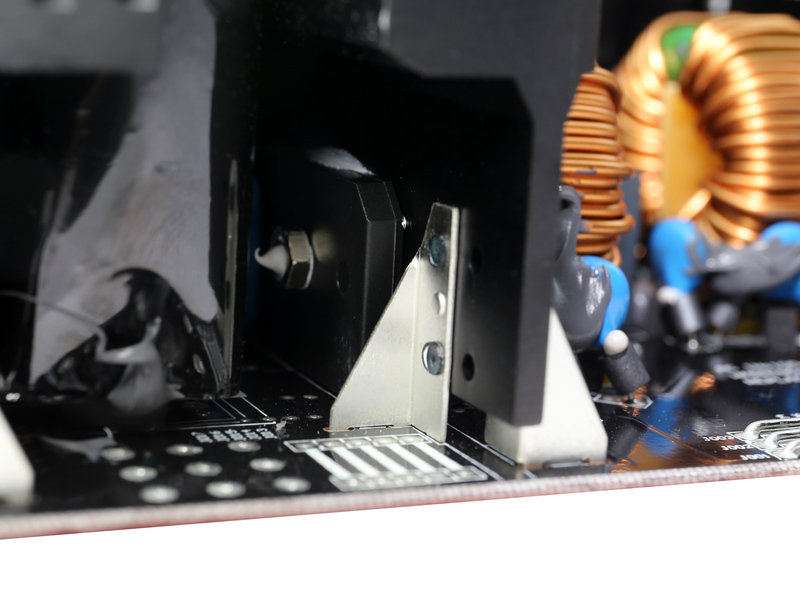 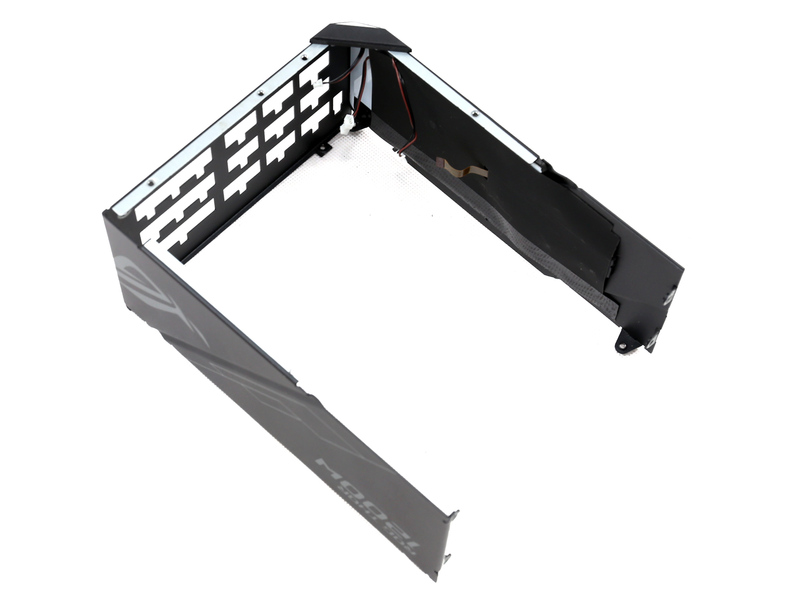 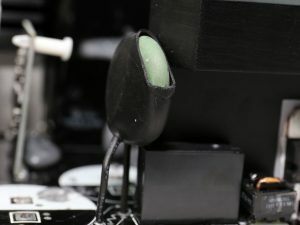 The new heatsinks allow for a much more relaxed fan profile while the DBB fan is able to cope with extra tough conditions, which cut a FDB fan’s lifetime short. 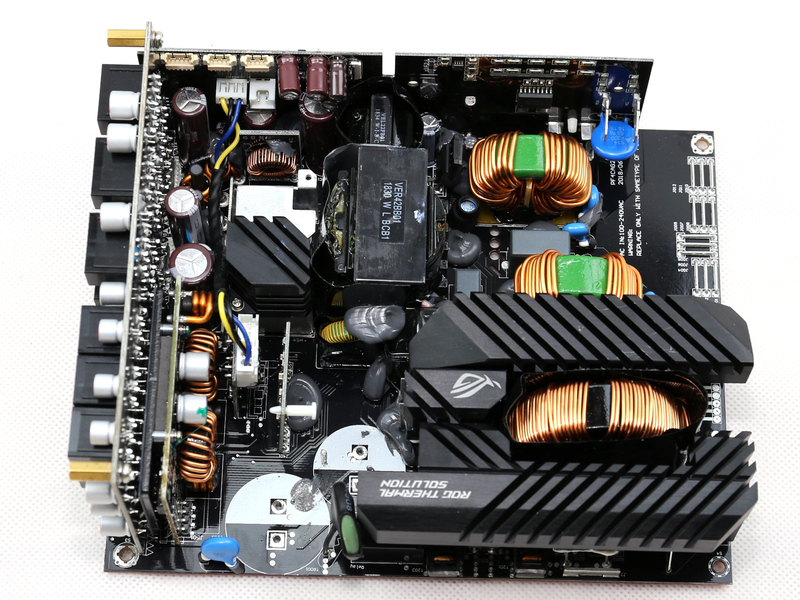 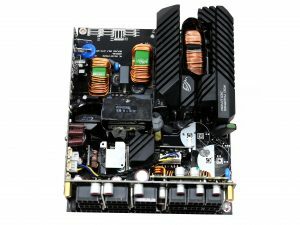 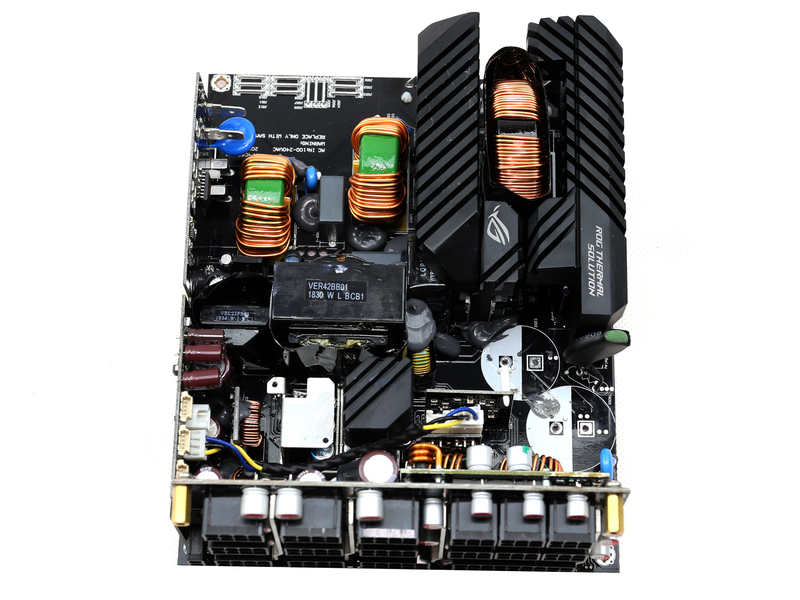 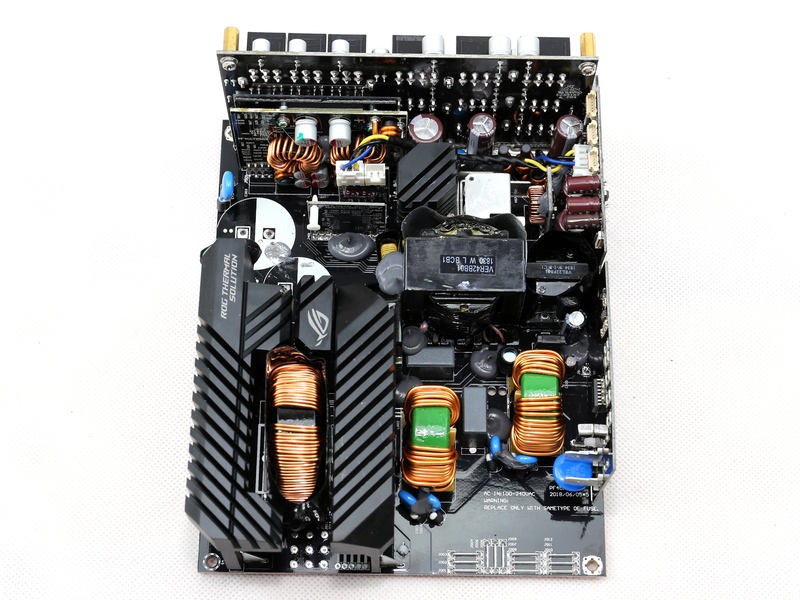 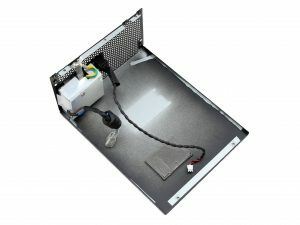 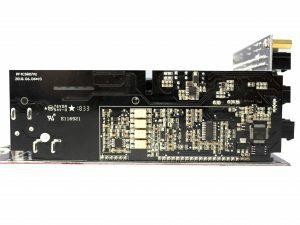 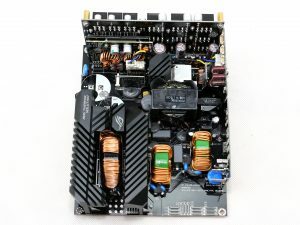 The build quality is high and the airflow seems unobstructed, since all heavy power transfers to the various parts of the board are conducted through the PCB and not through wires. 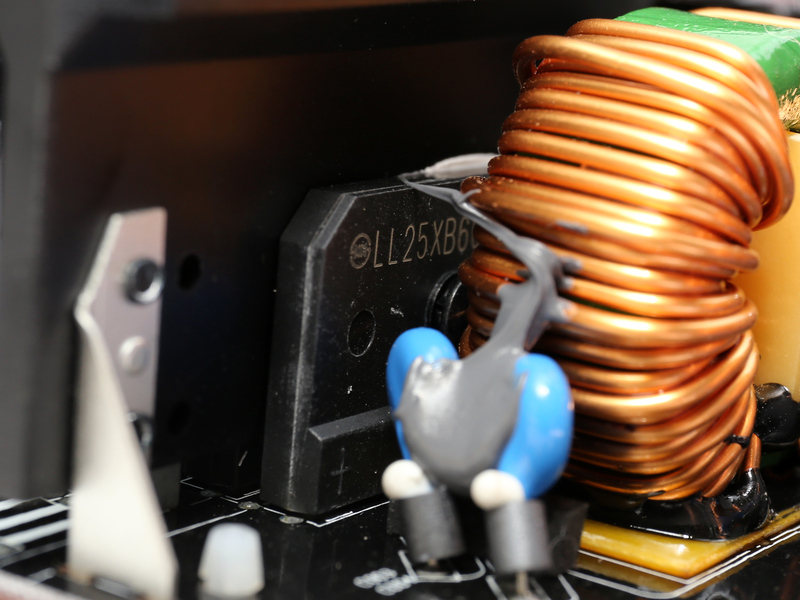 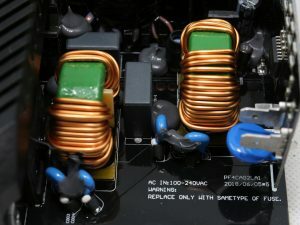 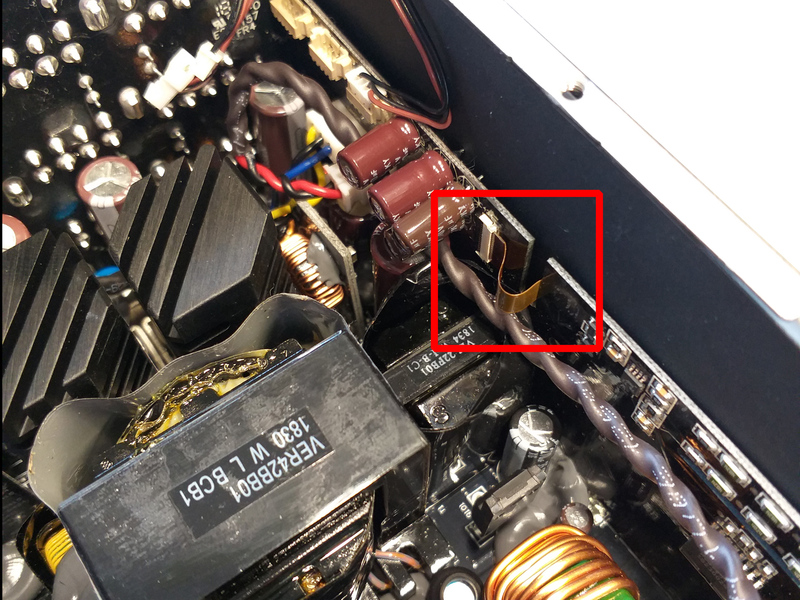 Only the fan’s circuit uses some wires, without a significant impact on the airflow though. Most of the filtering is handled by polymer caps, with the few electrolytic caps providing the necessary capacity in the secondary side, to cope with sudden (transient) load changes. 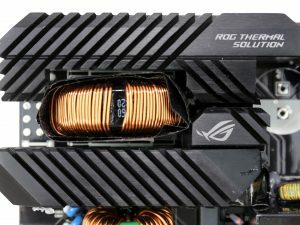 Obviously building a new platform from scratch wasn’t what Asus had in mind since it would require time and resources, so the main goal was to provide all extra features without changing the main core of the Prime platform. Whether the result was successful or not, we will see it after we finish all testing. 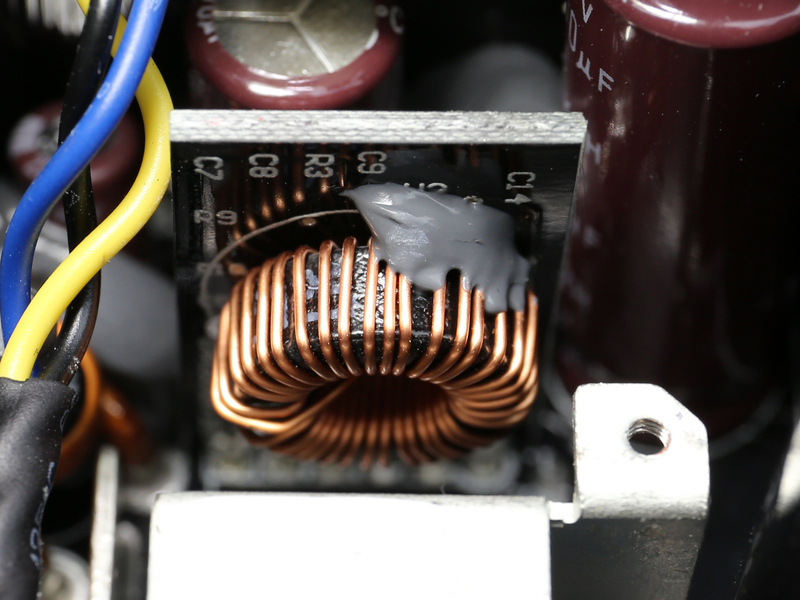 The first part of the transient filter is at the AC receptacle, as usual. 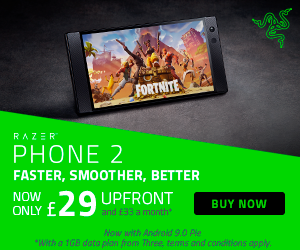 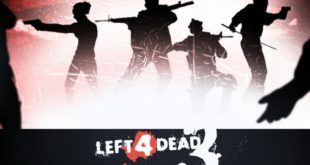 It includes two X and two Y caps. 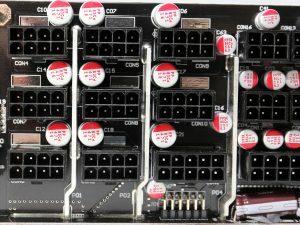 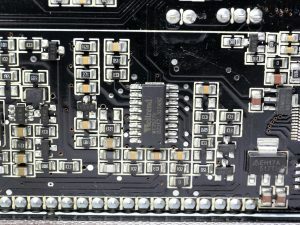 It continues on the main PCB with a single X and two Y caps. 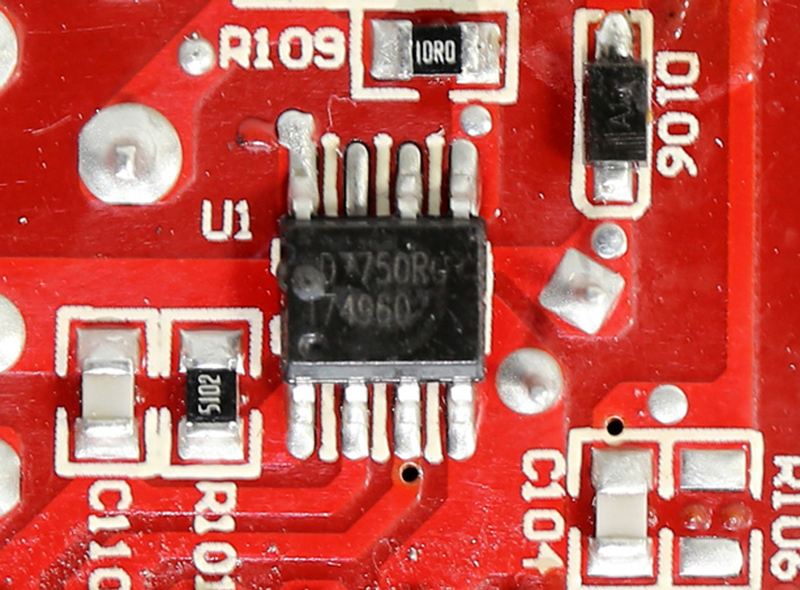 The second X cap shown in the photos belongs to the LLC resonant converter. There is also a MOV responsible for protection against surges coming from the mains grid. 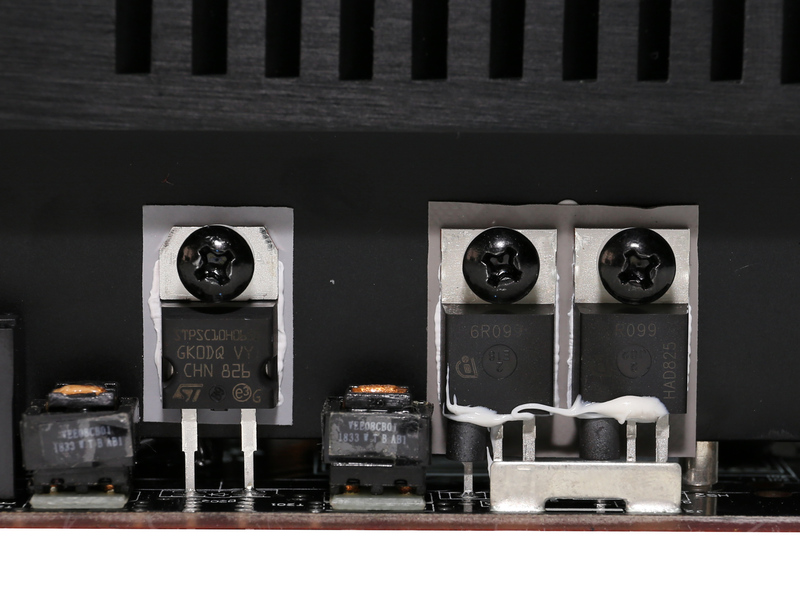 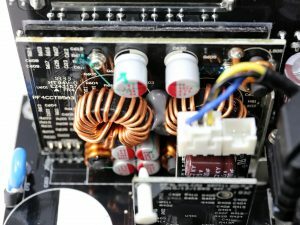 The bridge rectifiers are two powerful Shindengen LL25XB60C. Combined they can handle up to 50 Amps of current. 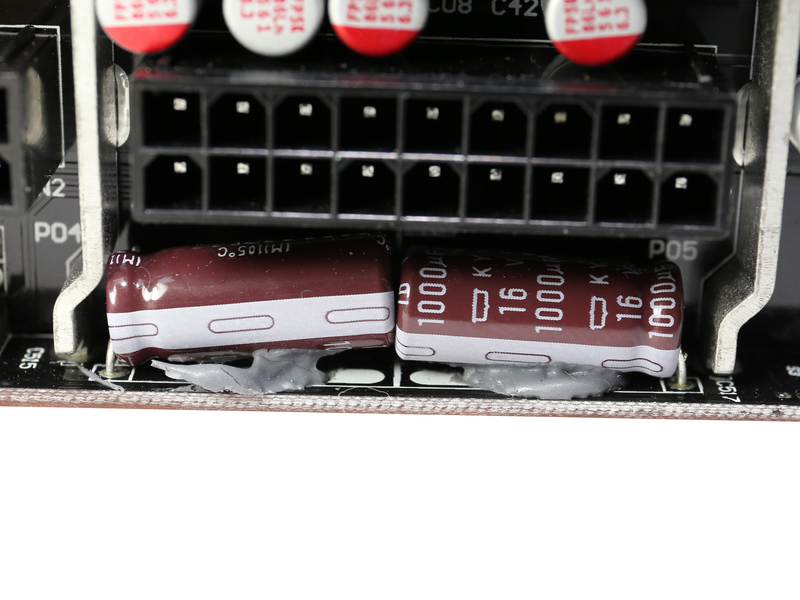 There is a NTC thermistor with a bypass relay, which protect the platform from large inrush currents. As it seems a larger NTC thermistor is required, since we measure quite high inrush currents during the PSU’s startup. 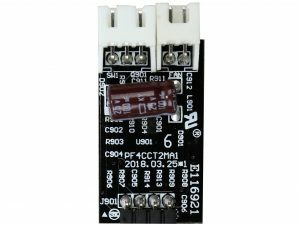 The APFC converter uses two Infineon IPP60R099CP FETs and a single STMicroelectronics STPSC10H065D boost diode. 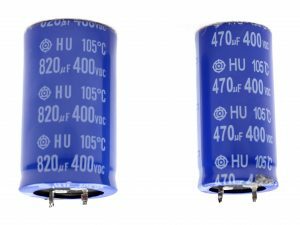 The bulk caps are provided by Hitachi and their combined capacity is large enough to offer a longer than 20ms hold-up time. 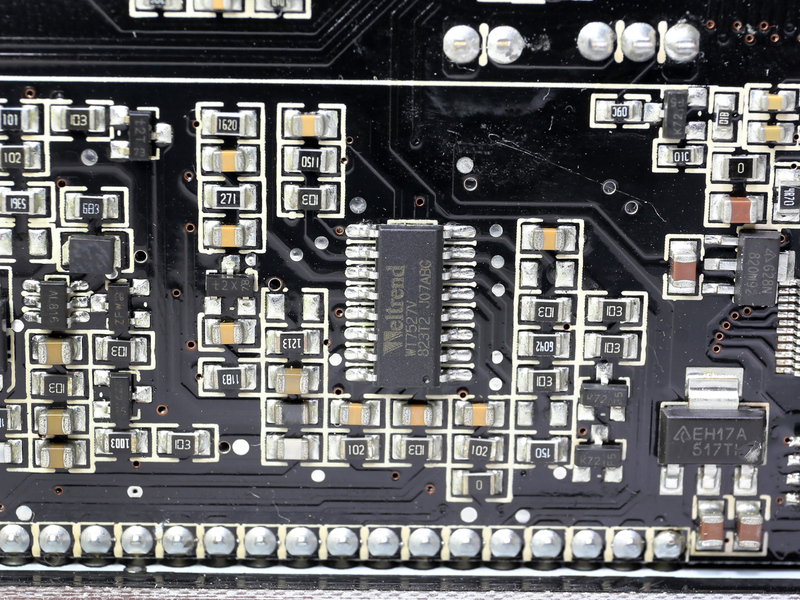 The APFC controller is a NPC1654, installed on a small daughter-board which is covered my Mylar tape. 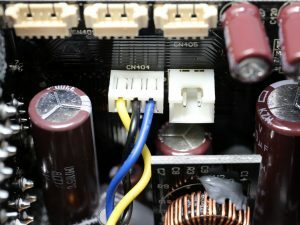 A lonely Y cap, installed right next to the APFC converter’s bulk caps. 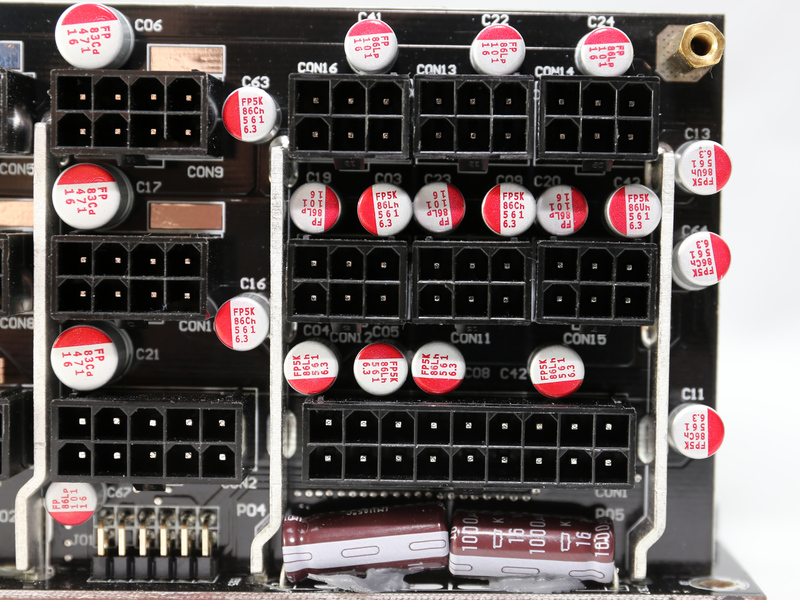 The main FETs, four Infineon IPP50R199CP, are configured in a full-bridge topology. 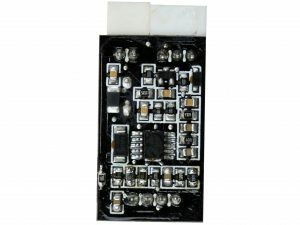 An LLC resonant is also utilized to restrict switching losses. 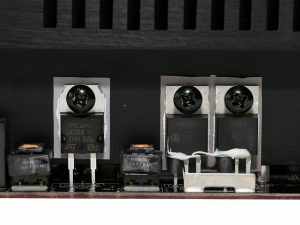 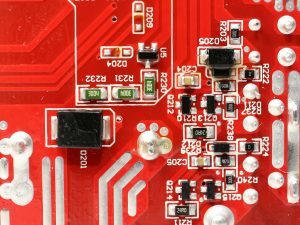 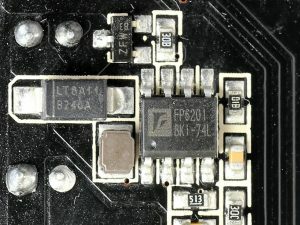 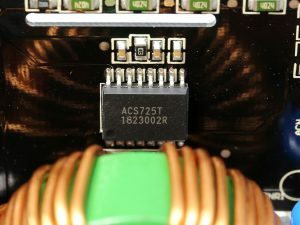 The FM/PWM controller is a Champion CM69016X. 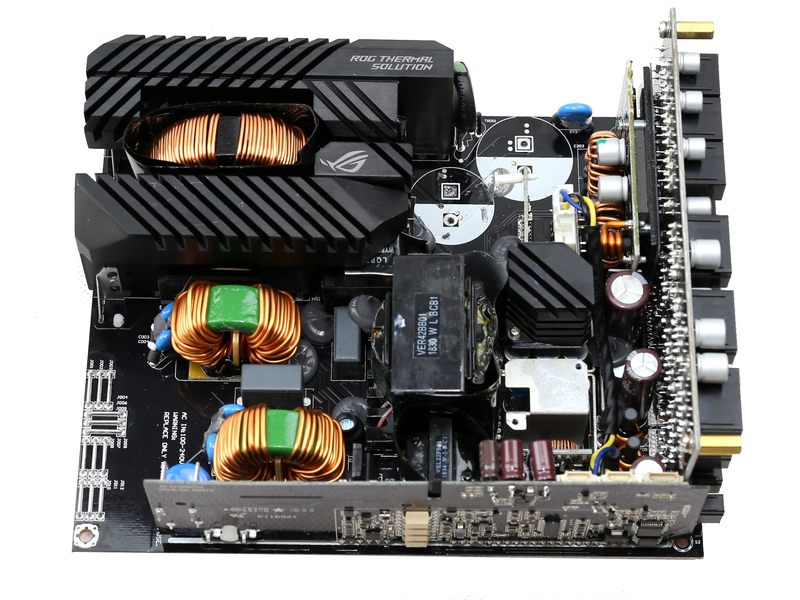 The latter is hosted on a vertical-board which is right behind the fan control board. Finally, the driver ICs of the main switching FETs are a pair of Silicon Labs Si8230BD. 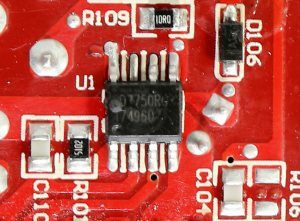 The current sensor IC is a Allegro ACS725T. The main transformer resides next to a smaller transformer, which is used by the 5VSB circuit. 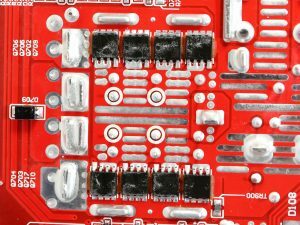 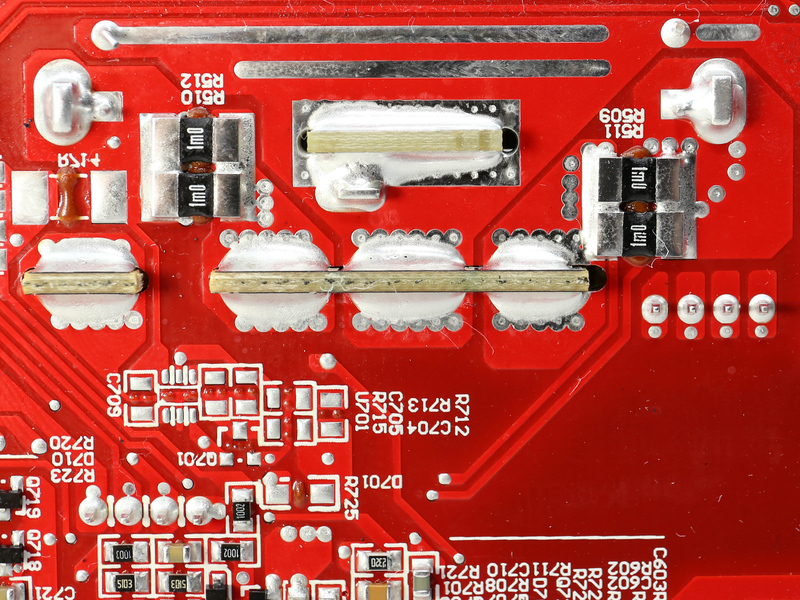 The +12V rail is rectified by eight Nexperia PSMN1R0-40YLD FETs, installed at the solder side of the board. 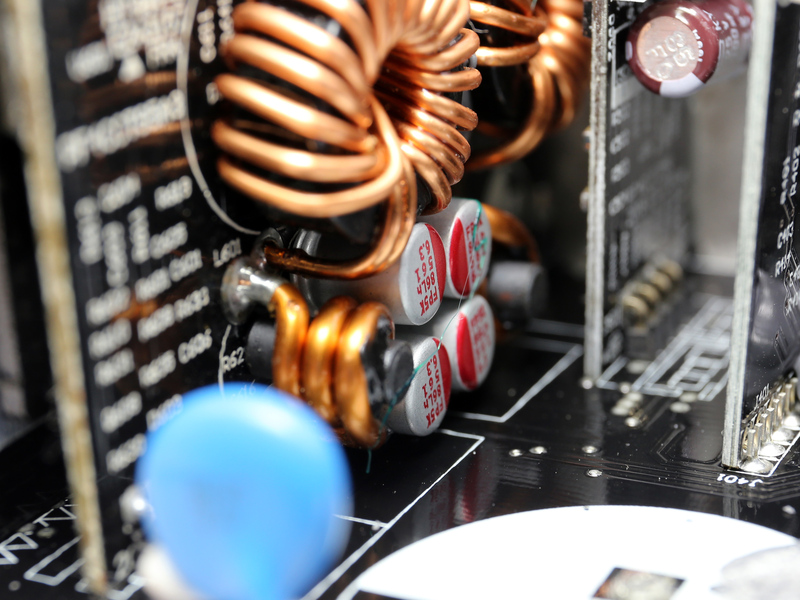 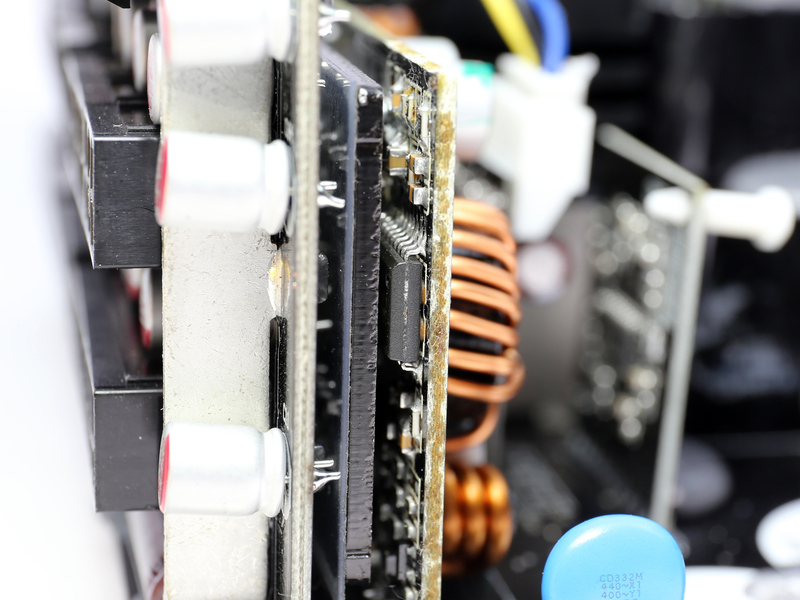 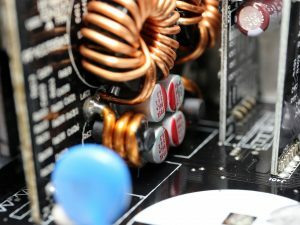 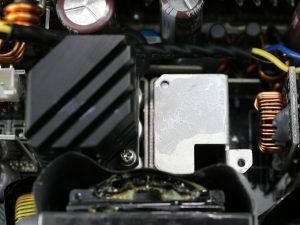 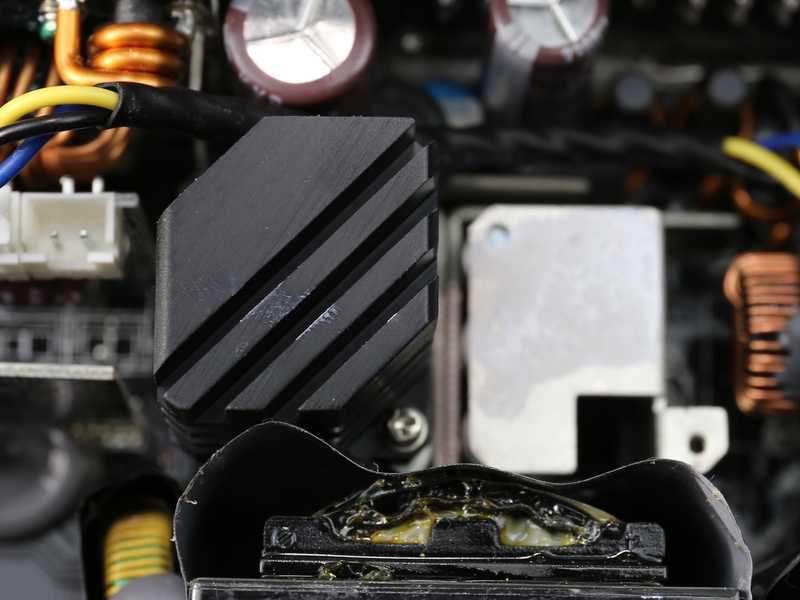 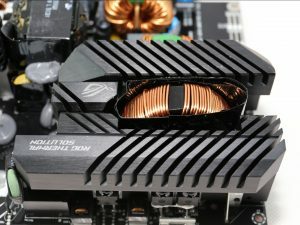 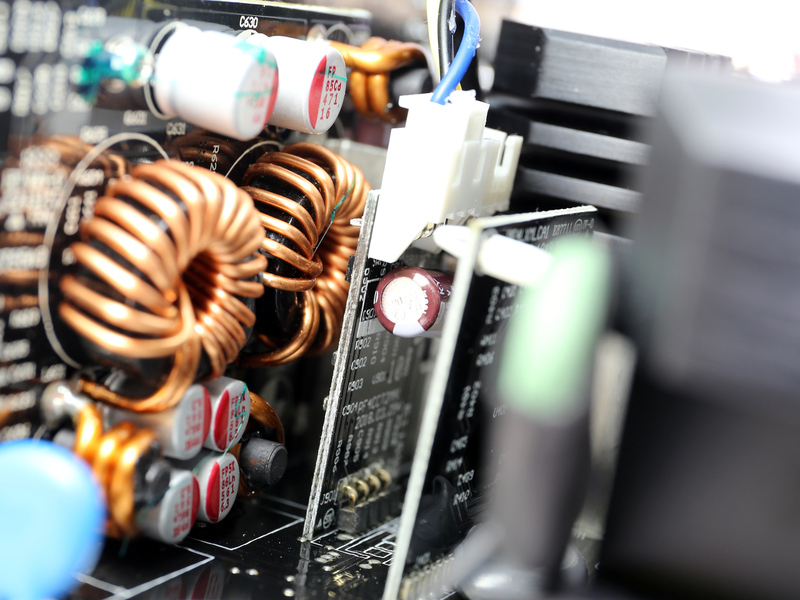 There are two heatsinks right above them, on the business side of the PCB, which assist in their cooling. 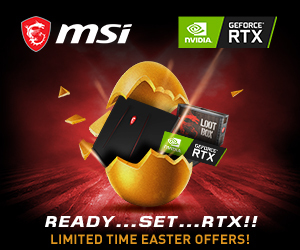 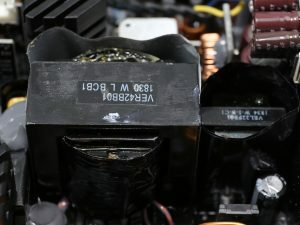 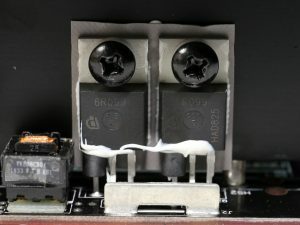 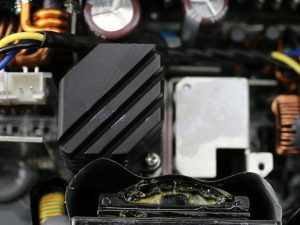 Those heatsinks consist of two parts each and thankfully there is thermal paste between them. 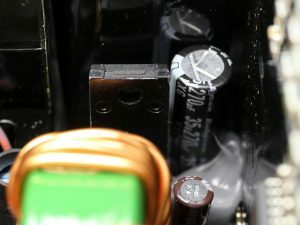 The ripple filtering on the secondary side is done by a combination of electrolytic and polymer caps. 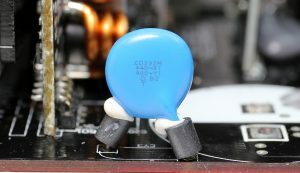 The electrolytic caps are provided by Chemi-Con (W, KY and KYB lines) while the polymer caps are by FPCAP and Chemi-Con. 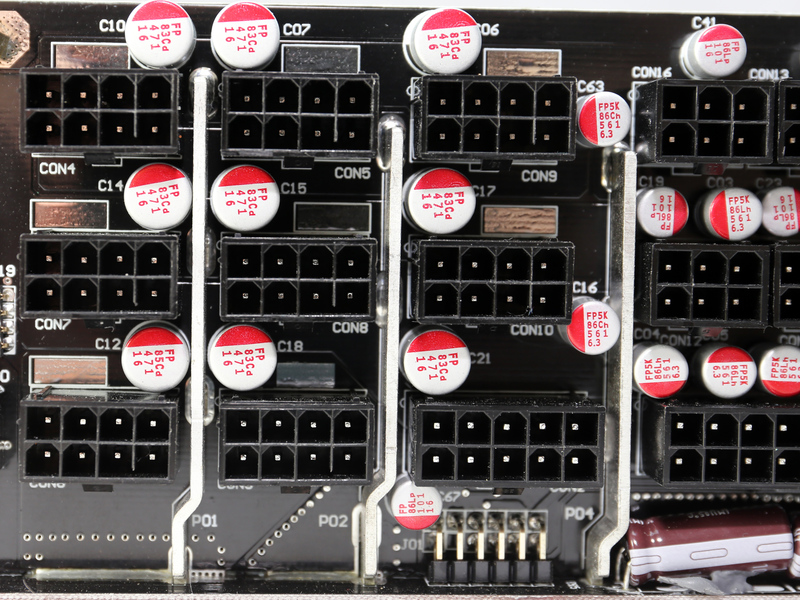 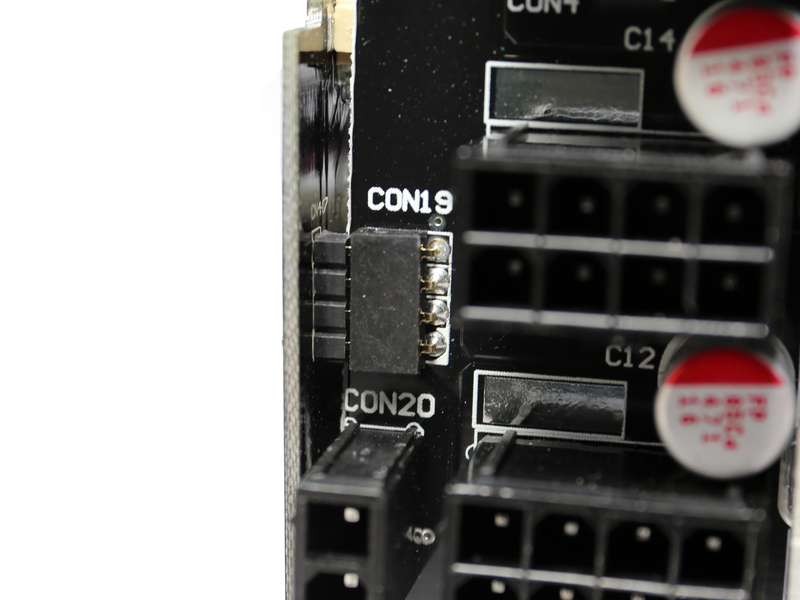 This board holds both DC-DC converters, responsible for the generation of the minor rails. 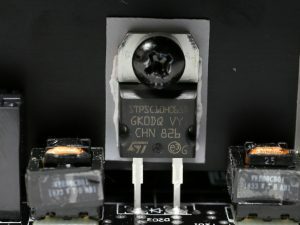 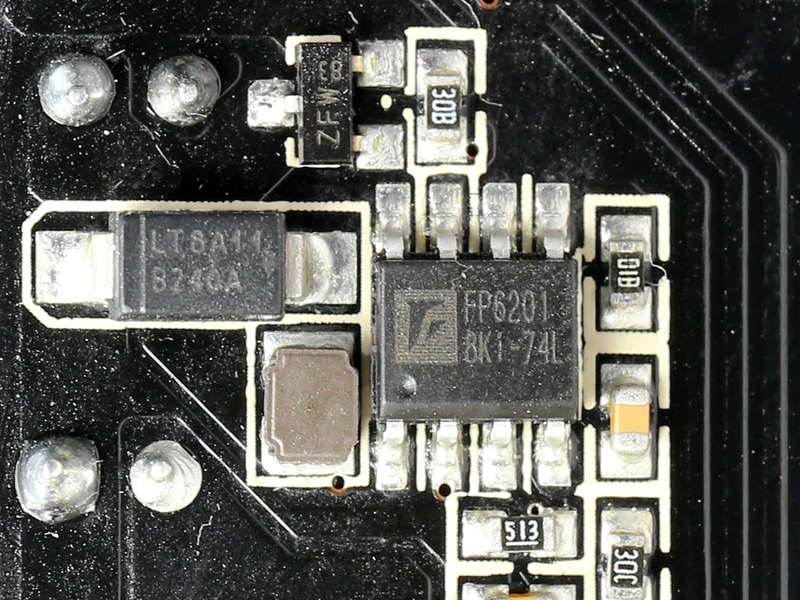 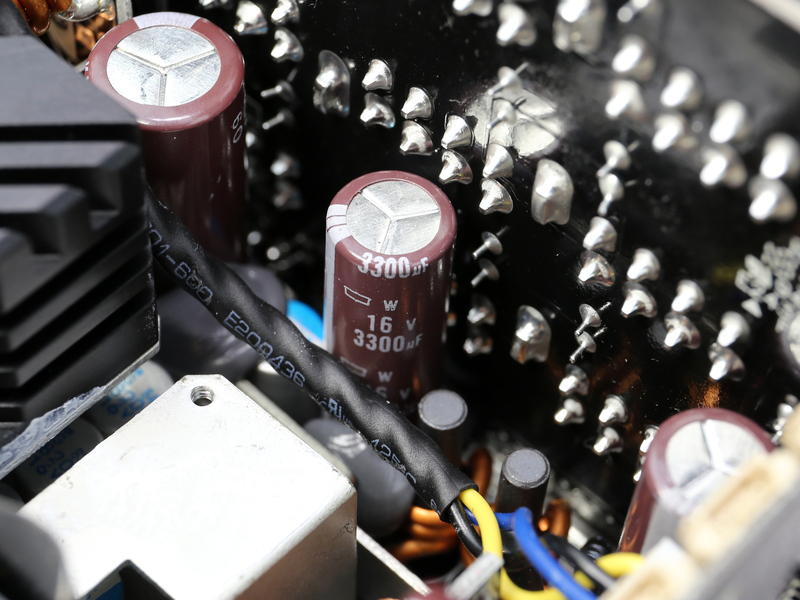 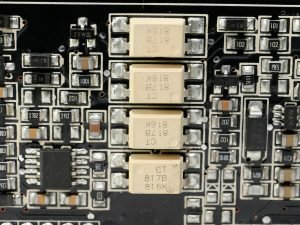 The 5VSB circuit uses a Leadtrend LD7750R buck converter, installed on the solder side of the main PCB, while the rectifier is a STMicroelectronics STU6N65K3 SBR. 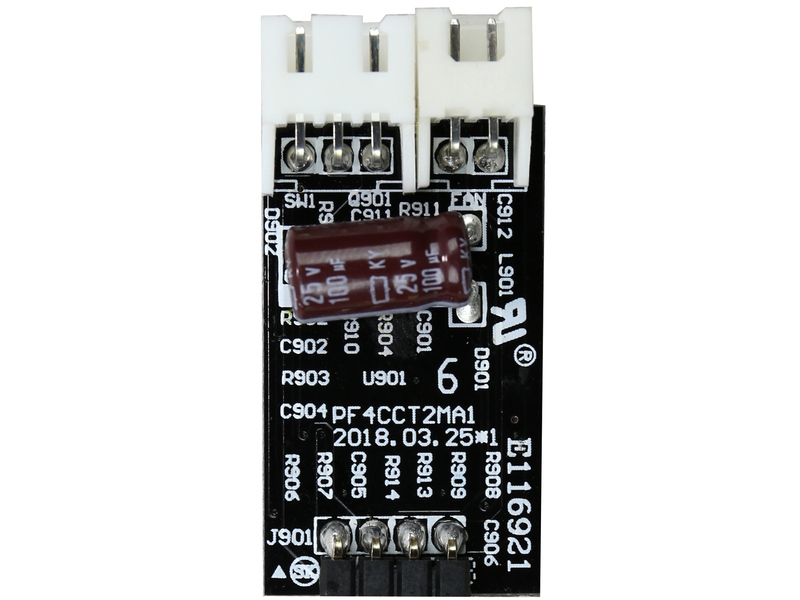 There is a dedicated rectifier for the -12V rail, which is a Lite-On LSP5523. It is installed onto a small board, right next to one of the +12V heatsinks. 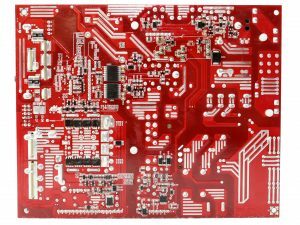 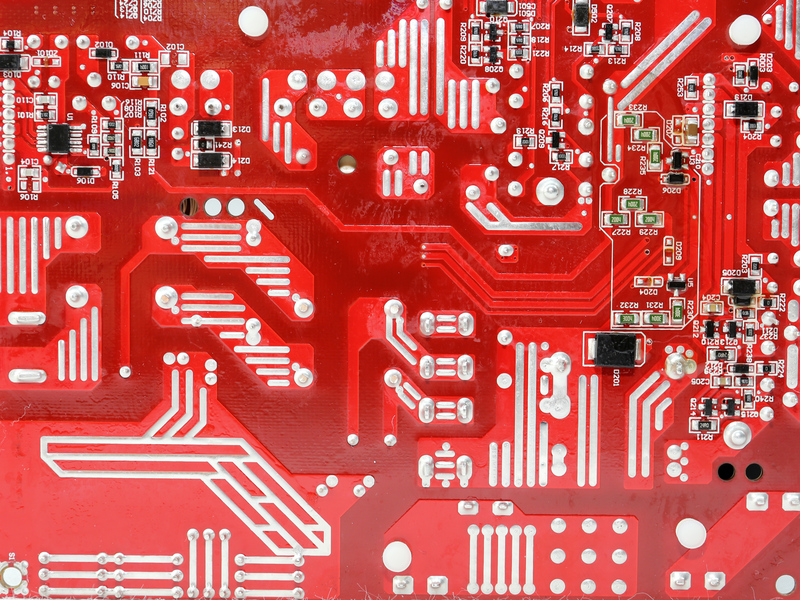 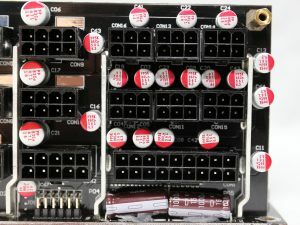 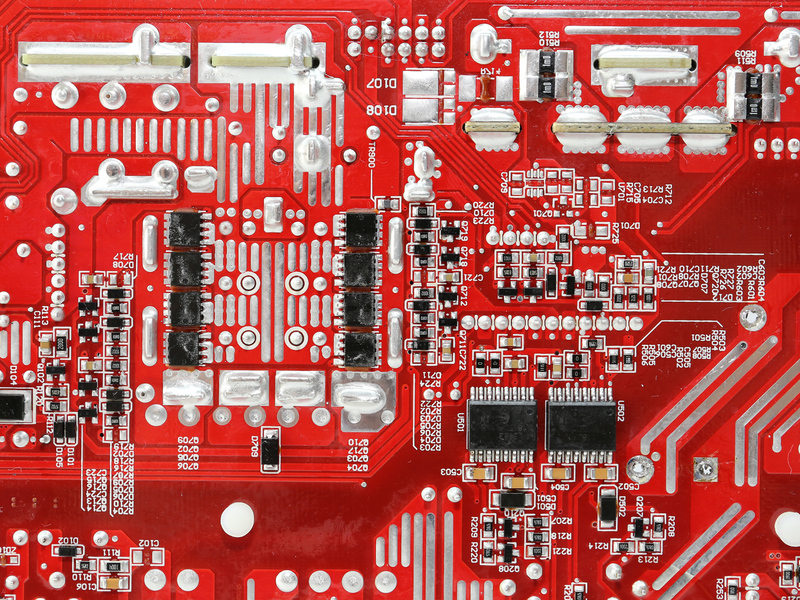 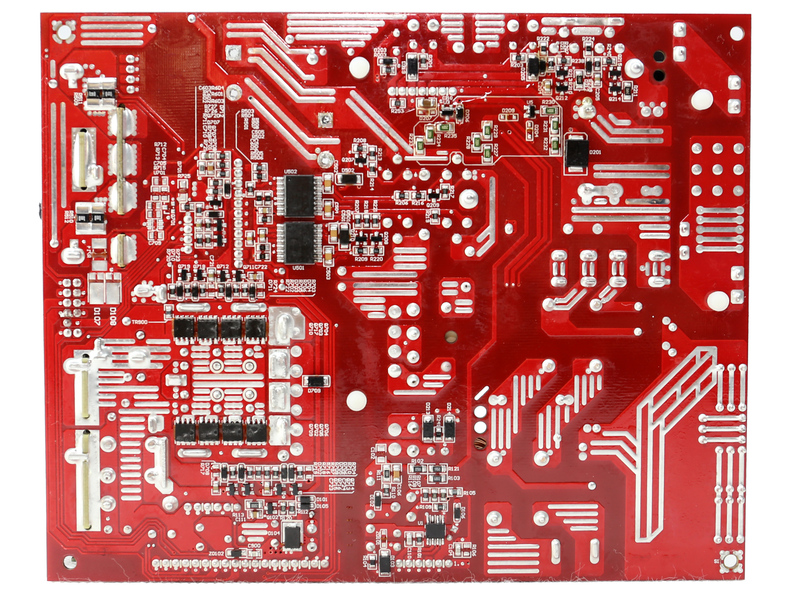 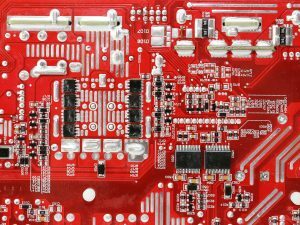 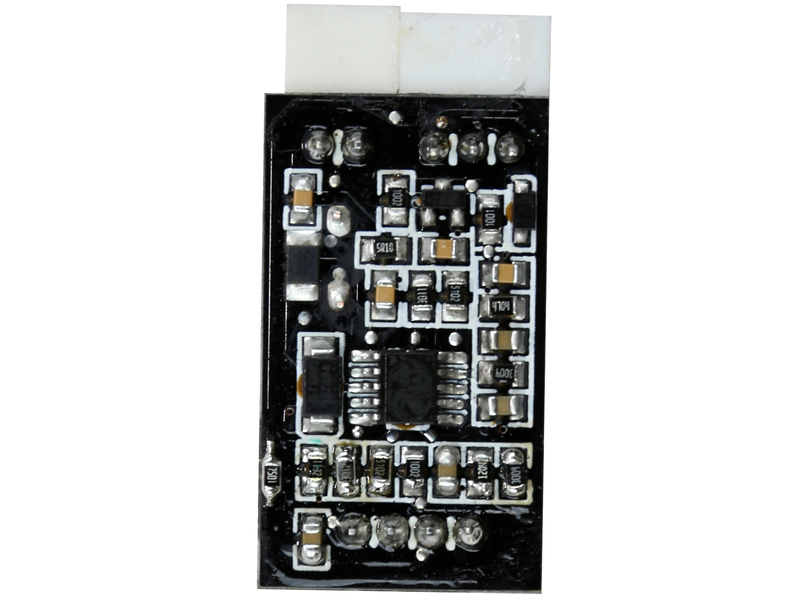 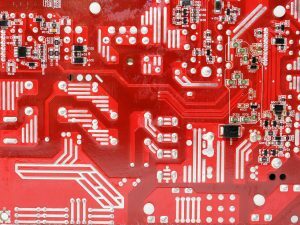 At the front side of the modular PCB a large number of polymer caps along with a pair of electrolytic Chemi-Cons (KY series) are used for ripple filtering purposes. 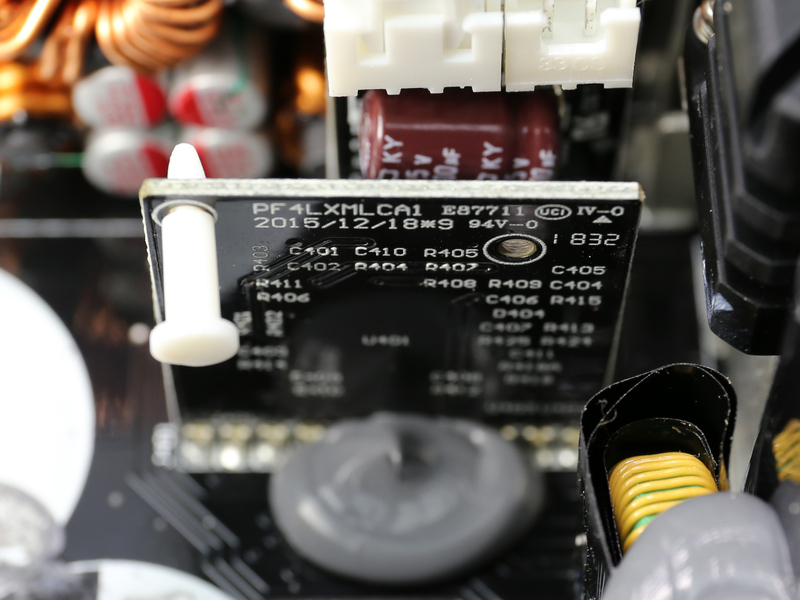 A large board, residing in the secondary side, holds the supervisor IC (Weltrend WT7527V). 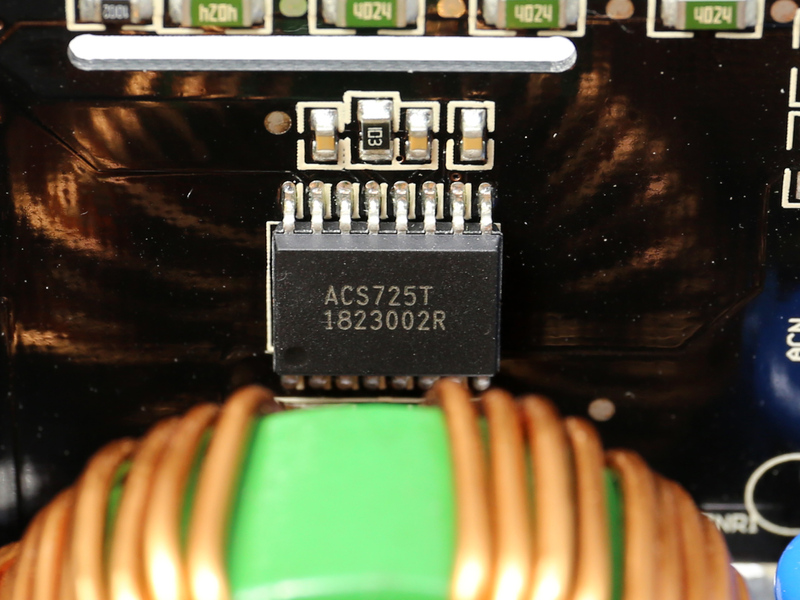 We also find an AS393M dual voltage comparator, residing in the primary side, which most likely provides data to the supervisor IC which is located in the secondary side. 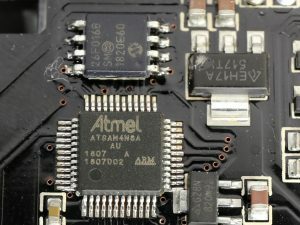 On the same board we also find a Microchip ATmega8A micro-controller and its flash memory (Microchip SST26VF016B). 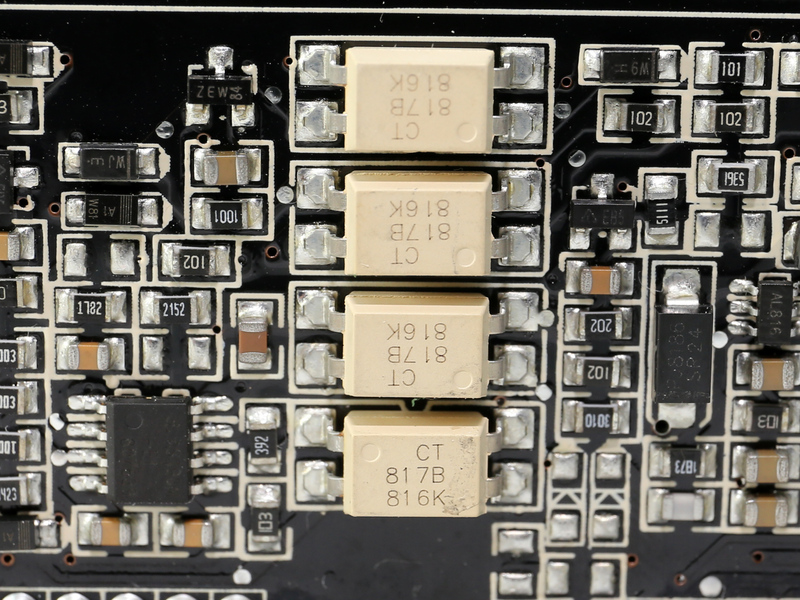 We also found a FP6201 switching boost regulator on this board, along with a LT8A diode. 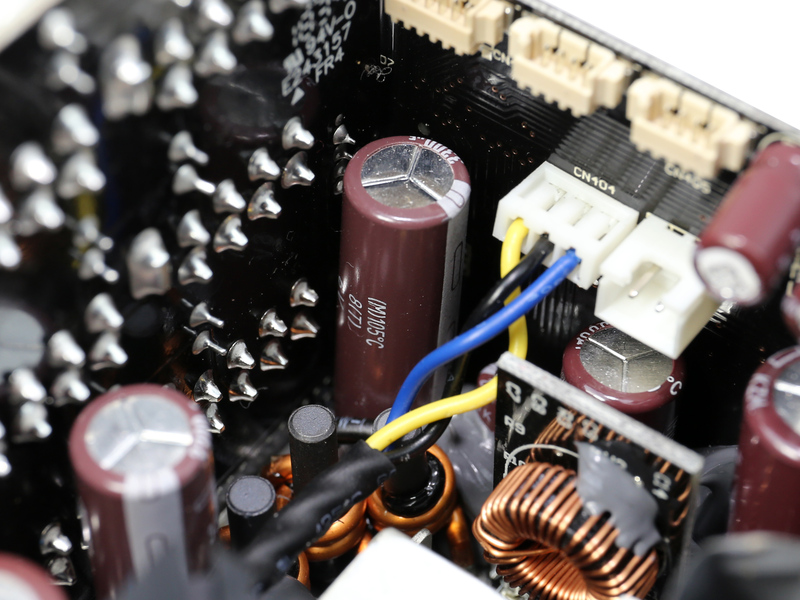 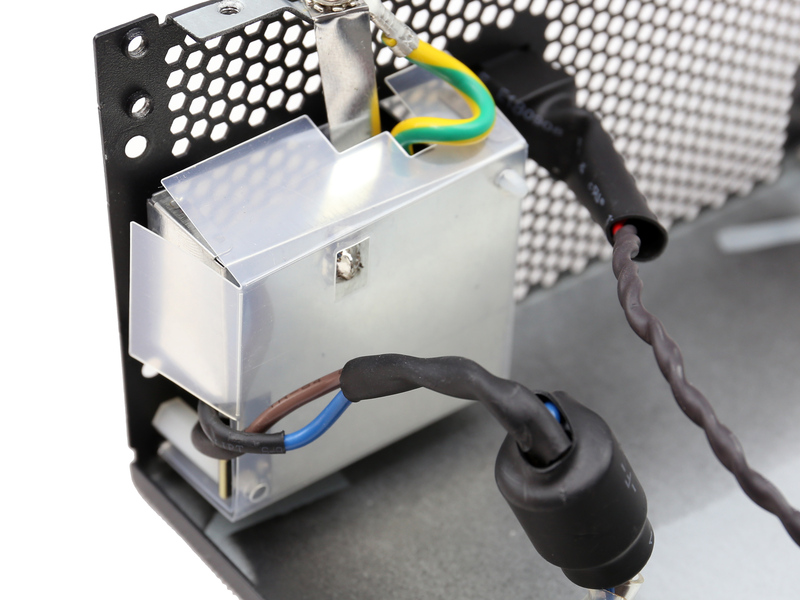 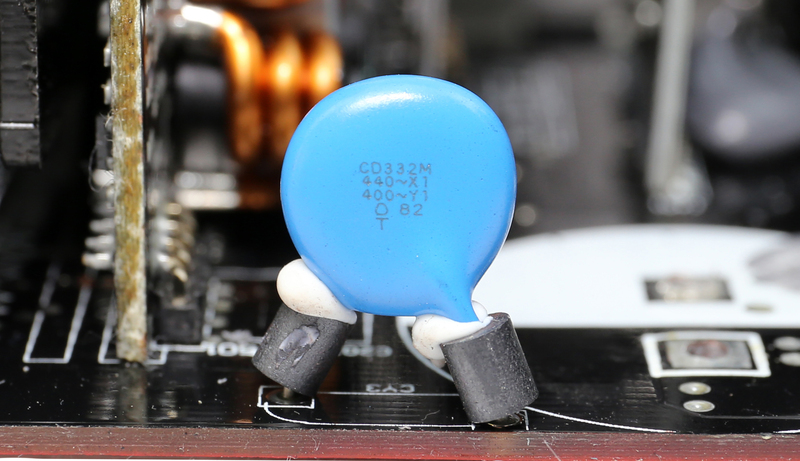 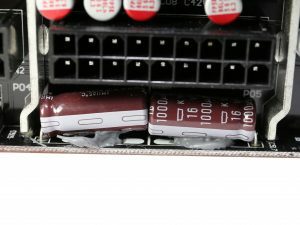 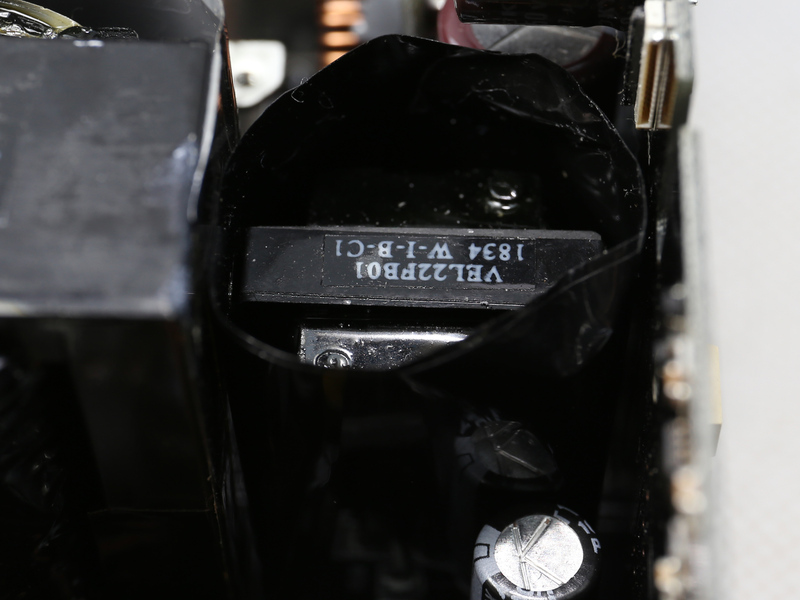 Those two parts are most likely used to provide power to the PSU’s OLED screen and/or some of the RGB lighting. 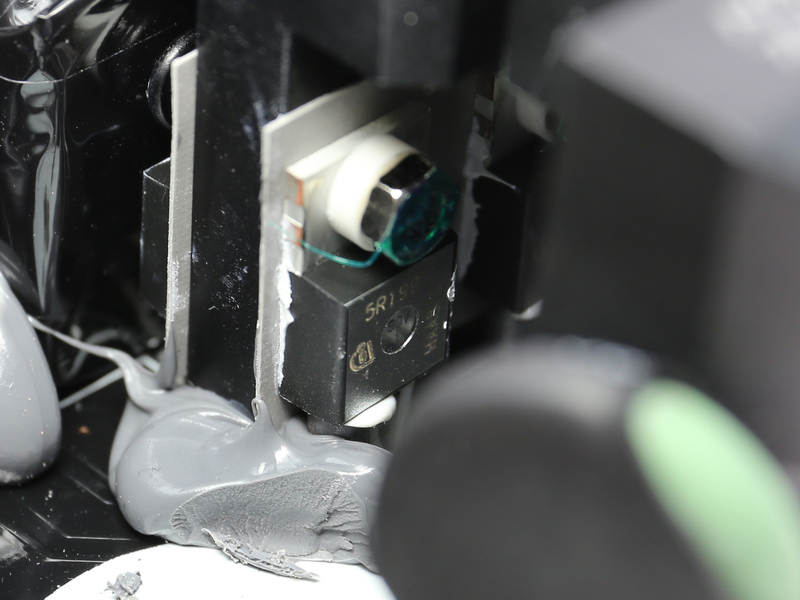 The OLED screen is installed on the chassis and it is connected to the platform through a small ribbon cable. 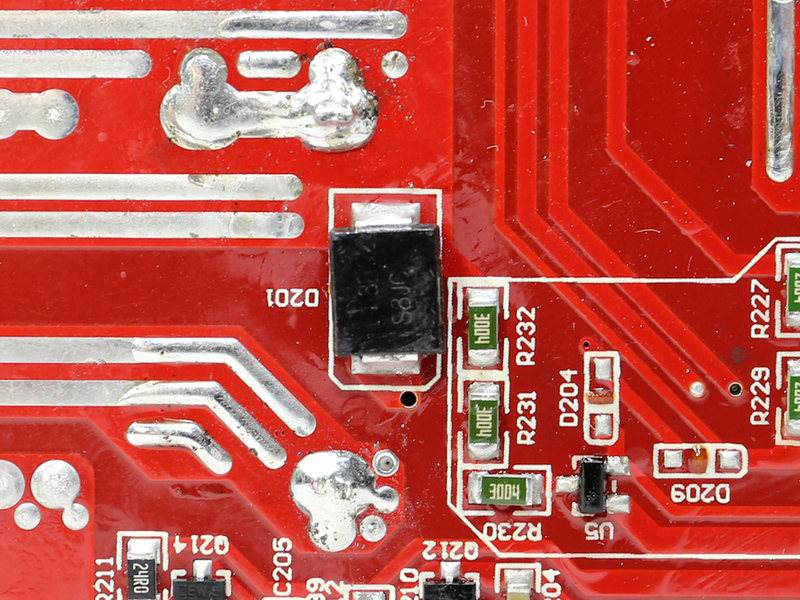 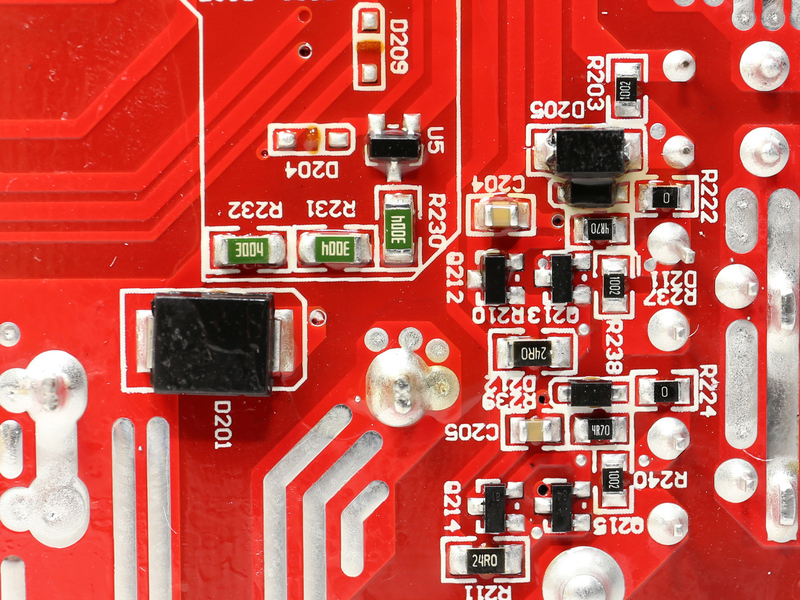 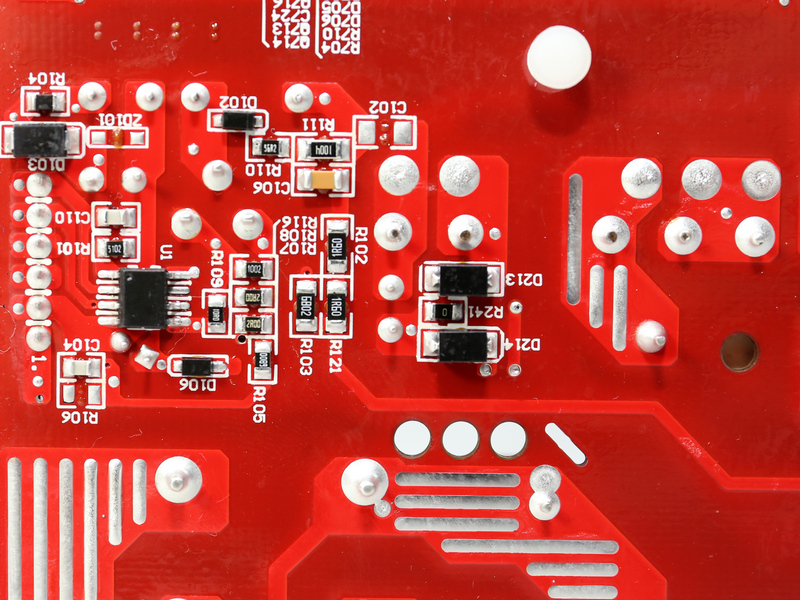 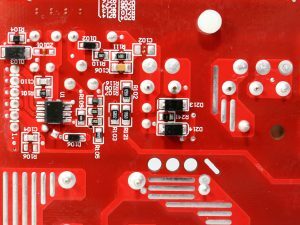 The soldering quality on the main PCB is quite good. 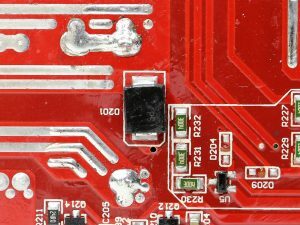 The fan control board is connected to the board that holds the micro-controller. 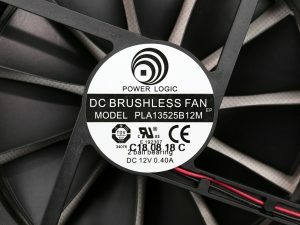 The cooling fan uses a double ball-bearing and its model number is PLA13525B12M. It measures 135mm across and it is very quiet, because of the highly relaxed speed profile that controls it.